The media universe returns to the current version of Minecraft. 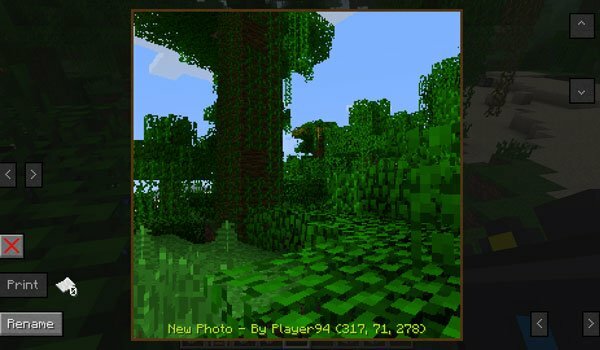 CameraCraft 1.4.7 is a mod that allows us to craft the cameras and video cameras to capture everything we see in Minecraft. As for the camera, we need to create batteries or filters with different shades to “tweak” the color of the images. As for the video camera can record in full color or also using tapes in black and white film to capturing our environment in gray tone. But that’s all? Really not because we can process the photos we do with our digital camera with a special block that will enable us to print and hang on the walls. Although adds another amazing feature that’s the ability to teleport us where the photo was taken. How to install CameraCraft Mod for Minecraft 1.4.7? Paste the .zip downloaded file, inside “.minecraft” / mods folder. Cameras and video for Minecraft!